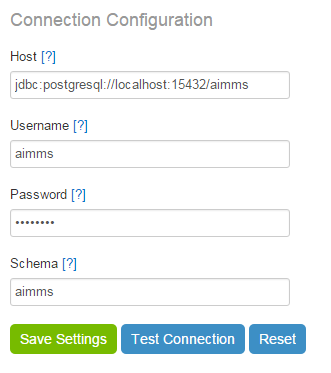 In the Connection configuration section, you can configure the PostgreSQL database that AIMMS PRO connects to for storing its internal data. PostgreSQL comes bundled with the AIMMS PRO installation, so there is no need to set it up separately. The bundled PostgreSQL installation works out of the box. You need to enter the host (in JDBC format). 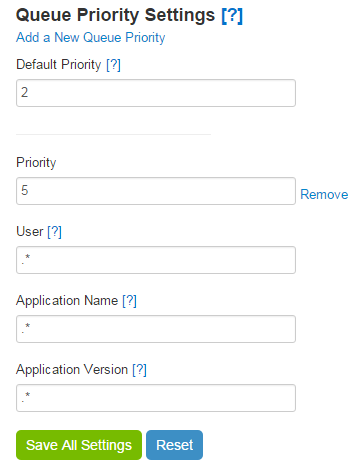 You may also need to change the username, the password and the schema name in the corresponding fields. You can use the buttons at the bottom of the window to either save your database connection settings, to test them (without saving) or to reset the changes that you have made to the settings without saving. If the connection cannot be established with the settings you provided, you will see an error message describing what went wrong. If you want your PRO to work in a cluster setup, you need to make sure that all your cluster nodes are connecting to the same database. Please refer to the section Setting up a cluster for further information. In this section, you can change all settings related to your PRO instance(s). 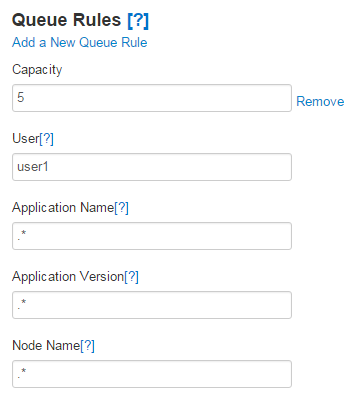 This includes both settings that are common for all nodes in a cluster (if you have one) and settings for any particular node in your cluster. This section contains the settings that were available in the AimmsPROServer.json file in AIMMS PRO 1.0. If you’ve performed a migration as described below, these settings will appear in this section; you will just need to make sure that they are correct. Some of the settings can be changed while running PRO; these will be applied immediately. If your changes however require a restart of all your nodes, you will get a message telling you so. The PRO configuration section consists of several subsections, each of which is explained in detail below. Please note that after the fresh installation of AIMMS PRO, PRO configuration page is pre-loaded with some default information. Hence as an Administrator it is required to check this information and click “Save” before starting PRO services. These are the general settings that the whole of your PRO setup is using, i.e. all nodes in a cluster setup (if you have one), not just the machine on which you run the AIMMS PRO Configurator. Storage directory: directory in which files are stored. Should be shared between all nodes (i.e. a shared directory on a network drive). Job retention time (days): time (in days) after which a job will be removed from the jobs list. URL of the JMS broker: URI of the server where JMS broker is running. 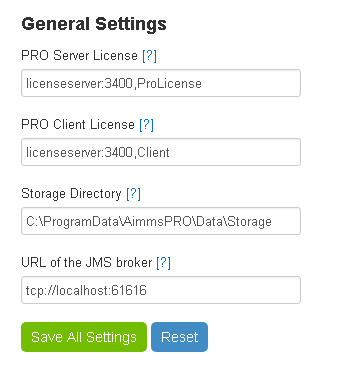 Change this value only if your JMS broker is on a separate server when using AIMMS PRO Cluster functionality. Please note that the last field ‘URL of the JMS broker’ is available in AIMMS PRO 2.17.1 or higher. 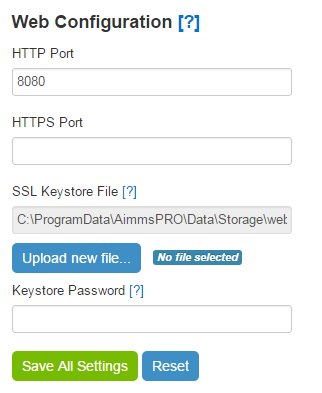 Here you can specify HTTP and/or HTTPS ports on which the AIMMS PRO portal will listen. For HTTPS connectivity, you must specify an SSL Key store file (optionally with a password) containing the server certificate and the private key to be used by the portal server. This section denotes which license profiles are available for server-side AIMMS worker sessions to perform server-based optimization tasks. Please note that the first (top) profile will be used as the default. Name: a name for the profile. Please give it some meaningful name, as it will appear on the publishing screen for a new app, where you will need to select the profile based on the name. 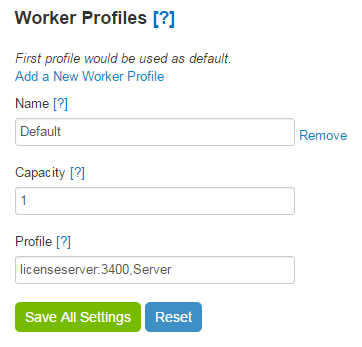 Please note that if you change this value or remove this profile, then all projects that are already using this worker profile will be using the default (first) worker profile. Capacity: this value denotes how many sessions this license profile can handle at the same time. The capacity should match (be less than or equal to) the amount of licenses available through this license profile in the AIMMS Network License Server. A list of priorities for PRO jobs that match the criteria specified in the priority rule. Priority: a lower number means a higher priority. User: the user that runs the application. Use . * for all users of all environments, . *@ for all users of a specific environment, or @ for a specific user and a specific environment. Application name: the name of an application. Use . * for all applications. Application names are case sensitive. Application version: the version of an application. Use . * for all application versions. Application versions are case sensitive. Starting with AIMMS PRO 2.17.2, this section has been moved to the Configuration menu of the AIMMS PRO Portal. A configurable list of rules that are applied to any request matching criteria specified for a particular rule. With these rules you can limit the number of jobs that can be run simultaneously by a particular user and/or a particular application on a particular node. Capacity: the maximum capacity that may be used for the jobs for this rule. Application name: the application name for the rule. Use . * for all applications. Application names are case sensitive. Application version: the application version for the rule. Use . * for all application versions. Application versions are case sensitive. Node name: the name of the node for the rule. Please keep in mind that nodes have their own capacity (see below), so the smaller capacity will be used to decide whether a node can process a particular job. Starting from AIMMS PRO 2.17.1 or higher, this functionality is removed as the concept of AIMMS PRO Cluster has been changed from this version and now the jobs will be distributed randomly to the nodes of the cluster. 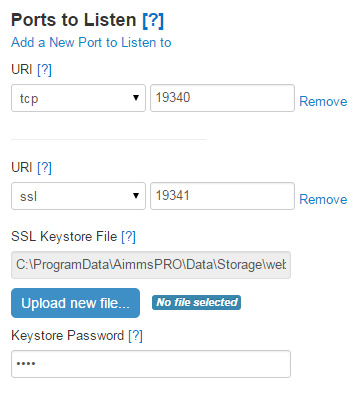 Port(s) on which the AIMMS PRO server will listen. URI: a protocol with a port to listen to. Format: ://: (e.g. tcp://:19340). Key store password: the password (if any) by which the SSL Key store file is protected. A list of settings for the servers that can be used by the AIMMS PRO server to dispatch server-side AIMMS sessions to. 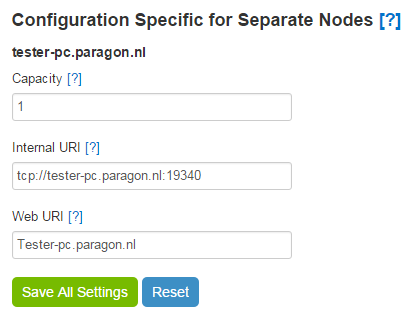 Each node automatically appears in this list when you are adding it to your cluster. You cannot add or remove server nodes from within the AIMMS PRO Configurator. Capacity: the number of parallel sessions that this node can handle at a time. Internal URI: The host to which AIMMS PRO web server will connect to the backend server. The value entered here should have a matching ‘ports to listen’ configuration. Format: ://: (e.g. tcp://myhost:19340). Web URI: The host (without schema or port) by which AIMMS PRO web server will be available in user’s browser. Usually, the default value is correct. Change this if the PRO host has a different hostname on the external network (the one that users are on). Format: ://: (e.g. myhost). Starting from AIMMS PRO 2.17.1 or higher, this functionality is removed as the concept of AIMMS PRO Cluster has been changed from this version. The migration from AIMMS PRO 1.0.x is facilitated by the AIMMS PRO Configurator. The Connection configuration should be correct. This means that the database that you have configured in the ‘Connection configuration’ section is available with the settings you have provided there. Your new installation should be using the same data folder as PRO 1.0. By default, it is ‘C:ProgramDataAimmsPRO’. The old database can be found at the ‘Data’ subfolder of your data folder from previous the criterion above. Look for the AimmsPRO.db3 file, which contains the configuration information of your AIMMS PRO 1.0.x installation. The old configuration file can be found at the ‘Config’ subfolder of your data folder. Look for the AimmsPROServer.json file. The AIMMS PRO configurator will check these criteria for you and will show an error message if they are not met. Otherwise, you can start the data migration using the corresponding button on the screen. Starting with AIMMS PRO Version 2.19.0 (2.19.0.303), Migration tab has been removed from the AIMMS PRO Configurator. If you need to migrate from PRO 1 to PRO 2, please migrate first to AIMMS PRO 2.0 and then upgrade to the latest version. 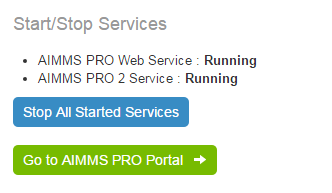 In this section you may start or stop AIMMS PRO 2.0 services and view service statuses. You will not be able to start or stop services if your PRO configuration is not valid. If so, you will get a message telling you what is wrong. AIMMS PRO Configurator has a section called “Backup management” that allows to manage backups of the AIMMS PRO database and configuration (but not the storage folder). Using this section PRO Administrator may manually make backups or schedule automatic backups (see below). This section consists of three sections. 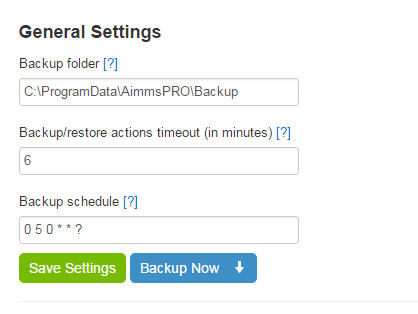 These are the general setting for AIMMS PRO backups. Actions timeout (in minutes) - timeout for all backup-restore actions (in minutes). 0 means indefinite timeout. Change this value if you have a large PRO database and backup (or restore) of the database takes a long time.
? means no specific value. Leave this field blank to disable automatic backups. Default value is 0 5 0 * * ? which means that backups will be created every day 5 minutes after midnight. The button “Save settings” validates and saves backup settings. The button “Backup now” immediately creates a backup. This section shows backups that were made from the current major version of your AIMMS PRO Suite. So if you had version 2.5.1003.100 installed, made some backups there, then installed 2.6.1001.200, made some backups and later on upgraded to 2.6.1003.300 then you will see backups from 2.6.1001.200 and 2.6.1003.300 in this section. Backups from 2.5.1003.100 will go to “Backups from other versions of AIMMS PRO suite” section (see below). You may select several backups and delete them if needed. You may select one backup and revert your database and configuration to the state that backup presents. Of course, that would mean that you will lose all applications published after that backup point. But if you restore to backup that contains those applications they will be available again. This section shows backups that were made from the versions different from the current major version of your AIMMS PRO Suite. See explanation about current major version concept in “Backups from current version of AIMMS PRO suite” section above. You may select several backups and delete them if needed. You may not restore any backup from this section. This backup section provides only possibility to backup AIMMS PRO database and its configuration files (that are located in %AIMMS_PRO_DATA%Config folder, e.g. C:\ProgramData\AimmsPRO\Config\). PRO administrator needs to backup the storage folder using some external tools if that is needed (for example, this way). There are lot of tools available for incremental backups.